David Murdoch's team were unable to repeat the heroics of Wednesday's semi-final win against Sweden. Great Britain’s men’s curling team have had to settle for silver in Sochi as they went down 9-3 to Canada in the final match. David Murdoch’s all-Scottish quartet conceded after eight ends after a strong start by the Canadians gave them an unassailable lead. Murdoch was the hero in Wednesday's semi-final when he claimed victory over Sweden with the very last stone. But a costly mistake by the skip in the third end, nudging one of his own yellow stones as he tried to take out three Canadian markers, left the team 5-1 behind and with a mountain to climb. Canada then piled on the pressure with a steal in the next end, when the GB team were looking to score with the hammer, to take a five-shot lead. The Canadians never looked back, and when Murdoch missed a straightforward chance to reduce the deficit to 8-4, the writing was on the wall. With the hammer in the ninth end, Canada duly picked up one more shot to take the score to 9-3. That was enough for Murdoch to call time and shake hands with the Canadian captain Brad Jacobs. At the team's main training base at The Peak in Stirling, around 50 new and experienced curling fans gathered to watch the match on big screens. 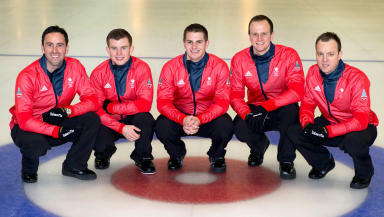 Despite falling at the last fence, the team of Murdoch, Greg Drummond, Scott Andrews, Michael Goodfellow and alternate Tom Brewster were described as heroes for making it to the Olympic final and inspiring a new generation of curlers. Logan Gray, ice development officer at Active Stirling, said more than 300 first-time curlers have taken to the rink at The Peak in the last fortnight. "It's great, it's the one time every four years where we don't have to go out and try to find people, they just come to us," he said. "From the point of view of getting people playing I don't think the gold really would have made much difference. Both teams have played well and there's been great exposure this week and people are finding out and trying the game. "There was little expectation on the guys going in and they hadn't been on great form, but Dave Murdoch has a knack of finding a way to win and pulling off the right shots at the right time. But when you're trailing by three or four shots in the Olympic final you have to take more risks, and a bad start was the difference." Mike Whittingham, sportscotland’s director of high performance, said: “Dave Murdoch’s team performed fabulously well en route to the Olympic final and have done us all proud. On the day however, Canada were stronger and I offer them my congratulations. “But a silver medal is a fantastic result for the team and for the sport in this country. This medal, added to the bronze won by our women on Thursday, has made this our most successful Winter Olympics ever in curling. Sports minister Shona Robison said: “This has been a wonderful Olympics for Scottish curling. We have been supporting Dave, Greg, Scott, Michael and Tom all the way and they done Scotland proud. “These athletes have grown throughout the completion and played some fantastic matches to secure that rarest of achievements - an Olympic silver medal. The result leaves the British team with four medals in Sochi, equalling their best ever performance at a Winter Olympics. The women’s curling team, skipped by Eve Muirhead, took bronze on Thursday with a victory over Switzerland.